To our mild surprise, Rodney announced that we had returned to Cape Denison during the night as the ice had been too heavy to make our intended landing at Port Martin, the former French base. We held off in the morning and went back for our last visit to Mawson's Hut after lunch. 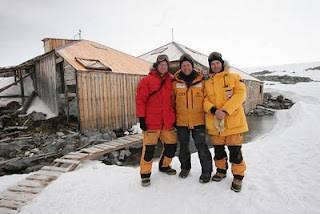 I took this opportunity to meet the three members of the Mawsons Hut conservation team who had arrived on the French vessel, Astrolabe, the day before yesterday (Day 10). Dr Dave from the team gave me a little rundown on their activities over the next five weeks and invited me over to see their digs at Sorensen Hut behind the hill to the east. A relatively modern hut, it contained all the kit used by today's expeditioners and stood in stark contrast to the meagre and rudimentary facilities afforded Mawson's team 100 years ago. Dave agreed, most generously, to stamp my little logbook and showed me the pile of philatelic covers and letters Australia Post had burdened him with for special marking. “They gave me a crash course, so I am now officially the postmaster of Cape Denison,” he said with a twinkle of pride, “I'll get through these during the next blizzard!” As a mark of farewell, the breeze quickened to a mild wind, enough to remind us that if it wanted to, it could muster 100 knots or more of bone-chilling katabatic tempest. We were grateful for the restraint.